If you're offline and looking for that personal touch, head to one of the city's three conveniently located Tourist Information Centers (TIC). There, you'll find out all about can't-miss attractions, activities and events from true experts. Greeting you as you get off your flight is the Denver International Airport Tourist Information Center, located in the main terminal, just north of the fountain after exiting the concourse trains. 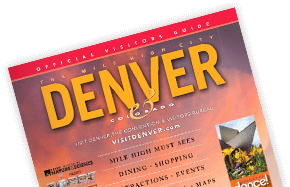 Get your mile high holiday off to a good start by grabbing a few of the hundreds of brochures and guides you&apos;ll find here. Denver and Colorado resources for lodging, dining, shopping, attractions and recreation opportunities are available, as well as plenty of free maps to help you get your bearings. Tourist and airport information is also available at the airport information booth directly east of the fountains. Denver&apos;s official Tourist Information Center is centrally located in the heart of downtown Denver. Inquiries about lodging, tours, attractions, dining and shopping are welcomed by a knowledgeable staff that can help you discover Denver by foot, car, tour or public transportation. In addition to offering brochures, the TIC features interactive screens to guide you in everything to see and do in Denver, as well as carrying AAA tour books, maps and even RTD passes. If you&apos;re here for a convention or meeting, this is the TIC for you. Located conveniently inside the 14th and California Street entrance of the Colorado Convention Center, the staff here is available to assist attendees with city questions and dining reservations - they know all the best restaurants in the city! There are more than 100 brochures promoting the best Denver has to offer. Have a question? Send it to VisitorInfo@visitdenver.com.